The weather is growing colder, which means it is time to develop a strategy for keeping your dog warm and healthy during the winter months. Listed here are tips for dog owners to best prepare their pets for winter. An age-old debate among pet owners is whether a dog requires a jacket. In general, young dogs, short-haired dogs, senior dogs, and animals with compromised immune systems can benefit from an extra layer of warmth when the temperatures are below freezing. There are many different types of jackets available, ranging from light barn coats to full-body parkas, and one can be found for any size, breed, or weather condition. If you live in an area that is prone to ice, purchasing pet-safe salt is important. Regular de-icing salt can become trapped in paws, not only causing pain but also posing a risk to animals that lick their feet. Pet-safe salt can be purchased at most pet stores and hardware stores and is non-toxic and paw friendly. Illness can spread more easily in the winter, so it is important to protect your dog’s immune system. 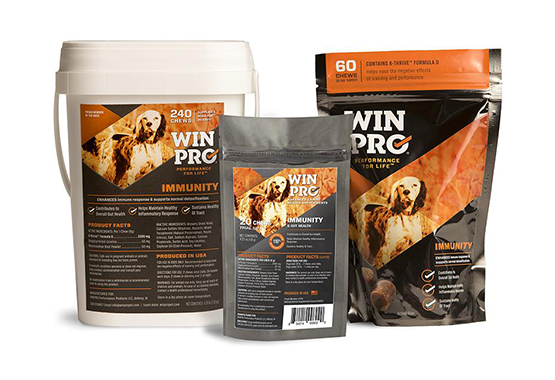 WINPRO Immunity is the perfect supplement for boosting your dog’s immune system, as it designed to fight the negative effects of stress and inflammation by promoting a healthy gut. If your dog lives outdoors, make sure his or her dog house is weather-proof. Ideally, a winter dog house should be free from drafts and made from a material that has good insulation. The floor of the dog house should be lined with straw or wood shavings. Avoid materials that can get wet and freeze, such as old blankets. Finally, outdoor dogs should always have access to water that is not frozen. Invest in a heated water dish if necessary. Ice, snow, and salt can all be harmful to a dog’s paws in the winter. There are many options for protecting a dog’s paws. These include salves, boots, and rubber paw coverings. If your dog frequently suffers from cold paws or has trouble gaining traction on ice, a paw protection product can be useful. Even though the weather is cold, your dog still requires exercise. 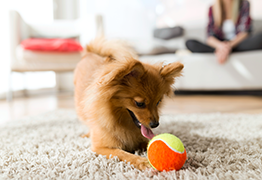 Dog owners can get creative and provide plenty of indoor exercise opportunities. For instance, you can set up a make-shift agility course in a spare bedroom or basement. Benches, couches, and PVC pipes can all be used to set up obstacles for your dog to run through. Another fun indoor activity is “hide and go treat.” Have your dog wait in another room while you hide treats. Once you are finished, help your dog sniff out the areas you have hidden the treats. This game provides both mental and physical stimulation and can keep your dog occupied for a long period of time! Cold weather can be more difficult for a dog that suffers from stiff, painful joints. A heated, orthopedic dog bed can help your dog maintain joint mobility in the winter. 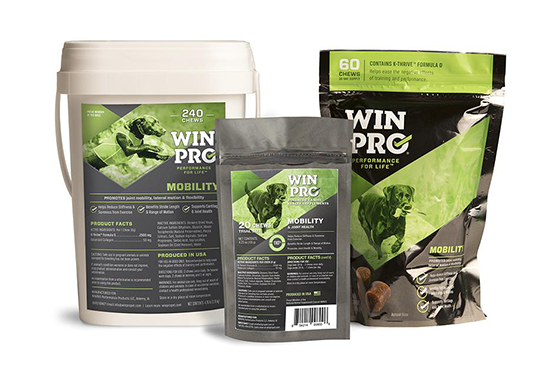 Another option is to give your dog WINPRO Mobility once per day. This soft chew is designed to improve mobility, lateral motion, and flexibility while reducing stiffness and soreness. Like WINRPO Immunity, the Mobility formula contains K-Thrive Formula D, which is a blend of animal blood proteins that target inflammation at the source. 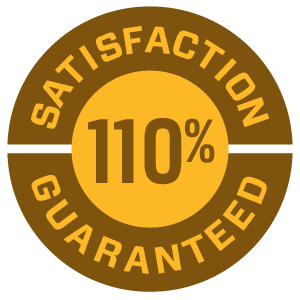 All WINPRO products are fast-acting and can be used in conjunction with other formulas, supplements, or medications. Antifreeze contains ethylene glycol, which is highly toxic to dogs. The sweet scent can be enticing to pets, leading them to lap up any spills in the garage. A better alternative is to use pet-friendly antifreeze, which contains propylene glycol and can be purchased at hardware stores. Dogs that live outdoors or spend a significant amount of time exercising in cold weather have higher nutritional needs. Depending on your dog’s activity level, size, and the outdoor temperature, your dog may require up to 30% more calories. Monitor your dog’s body condition to determine whether he or she is eating enough and consult your veterinarian if you are unsure about your dog’s nutritional needs.